Grant Warehouse Project Open House tonight. to review and comment on the various design plans for the project. 5021 NE Martin Luther King Jr. Blvd. More on the Grant Warehouse site here, here, here, there, and especially here. The history of the Grant Warehouse was the first story that captivated me when I began researching the history of Union Avenue/Martin Luther King, Jr. Boulevard. MLK boulevard in the news. The Oregonian has a new article discussing Portland Development Commission projects that are going forward at this time, and those that are stalled because of funding issues. The article includes several sites on MLK Boulevard, including the long-rumored 24 Hour Fitness at MLK and Alberta, which is listed as “delayed.” That now-empty block, of course, sits directly across Alberta from the building undergoing rehabilitation that will hold It’s About Me Fitness. Also, a nice review of belly (in the King’s Crossing building at Fremont and MLK) ran in last week’s Oregonian. Read it here. A review of Bridges appears on this website; the author is right about Bridges’ incredibly tasty bacon. Development along MLK Boulevard isn’t just a matter of private sector activity. The city takes an active interest in the boulevard, using Oregon Convention Center Urban Renewal funds through the Portland Development Commission (PDC) to spark development at different locations along the boulevard. King’s Crossing/the Fremont Project, which includes the “Fremont Building” (office space and street-level storefronts) completed in 2007, and the townhouses running to Grand behind it. Kings/Park, formerly known as Piedmont Place, on the southwest corner of MLK & Rosa Parks Way, which is at present an empty lot. This project is expected to be residential units for sale, with commercial storefronts along MLK. Grant Warehouse, currently an empty lot with a storied past. The PDC also has a hand in other projects along MLK, including the Miracles development and Shaver Green. 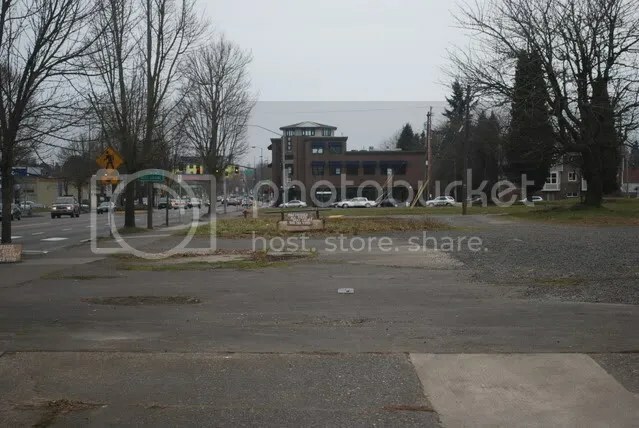 Some PDC documents relating to the Oregon Convention Center Urban Renewal Area and MLK Boulevard can be found here. 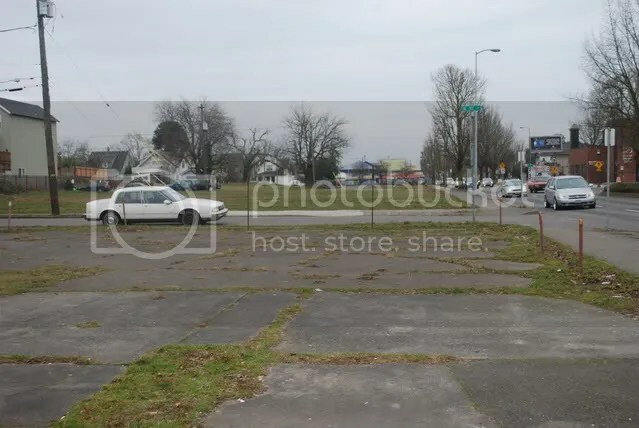 These two photos show the empty lots on the east side of MLK. The blocks run from Fremont to Ivy, Ivy to Cook, and Cook to Fargo Streets. Recently, a fence that enclosed half of the block between Ivy and Cook (providing nearby residents with a nifty, convenient dog park of their own) came down. The other side of that block once housed the Grant Warehouse; in the seventies this block held a tire store (Mor-Mile Tires). The first photo looks south, with the (former) Chester Dorsey Car Wash in the background; the second is facing north across the empty lots, with the Kings Crossing/Fremont Building in the background, on the other side of Fremont Street. In the center of the photo are signs for mattress sales, although there are no mattresses there at the moment (obviously).